Yesterday was released the new Linux Mint 14 codenamed "Nadia" in two flavours: Cinnamon and MATE. I downloaded the 32 bit MATE version, put it on a bootable USB for a quick try. At the first look is a plain and simple (remember, for a desktop, "plain and simple" is a good thing) traditional GNOME 2.x desktop with a lot of gray, a bit of green and a single-panel layout. It was not a big effort to bring it to something familiar. This is the natural GNOME 2 successor. It have an own applications menu, but only a couple away is the classic Applications-Places-System GNOME 2 menu. The themes available are limited and defaulting to green - easy to customize, I bet you can put GNOME 2 themes in place. Look forward earlier next year for the Fedora 18 release which will have MATE available for repos for a yum install (probably Fedora 19 later next year will have a dedicated spin). Doesn't fedora 17 already have mate in the repos? 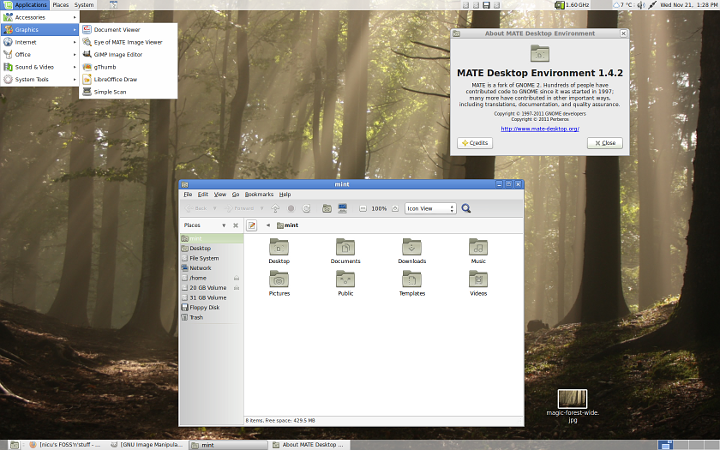 I can also see a group "MATE Desktop Environment". For example, most of the commits on https://github.com/mate-desktop/mate-file-manager/commits/master come from gnome. is still young and so far backed only by Mint, will have a chance to survive it enough people will switch to it. if not, it will be natural selection. So far as the default software selection goes... Fedora includes a few additional things that take up room... like SELinux and related tools. Also, if Mint is like Ubuntu... they get away with leaving a bunch of off the media because it downloads quite a bit during the install. Fedora could easily fit more software in the builds if everyone was willing to drop the idea of a single CD for their spins and move to a single DVD. You don't have to wait for a MATE desktop spin to materialize. You can make your own. As you may or may not already know, Fedora releases all of the kickstart files that they use to make their spins and if you want to modify an existing one or make a completely new one, it is easy to monkey-see monkey-do with those. That's how I make my remix which is about 2GB (6GB installed) and includes GNOME 3, KDE, XFCE, LXDE, Cinnamon, and MATE... along with a good set of desktop applications. I have remixes for Fedora 17 and 18 (pre-release). It is a bunch of fun. Mint dropped the single-CD idea, the ISO is 966 MB: LivdDVD or Live USB. There is talk about Fedora doing the same for years. MATE is an official feature for F18: http://fedoraproject.org/wiki/Releases/18/FeatureList that is what "normal" people are supposed to use. I played with Cinnamon and F17 back when it was in an external repo and the experience was less than ideal. Anyway, the news are positive: easy install in F18, easier in F19. 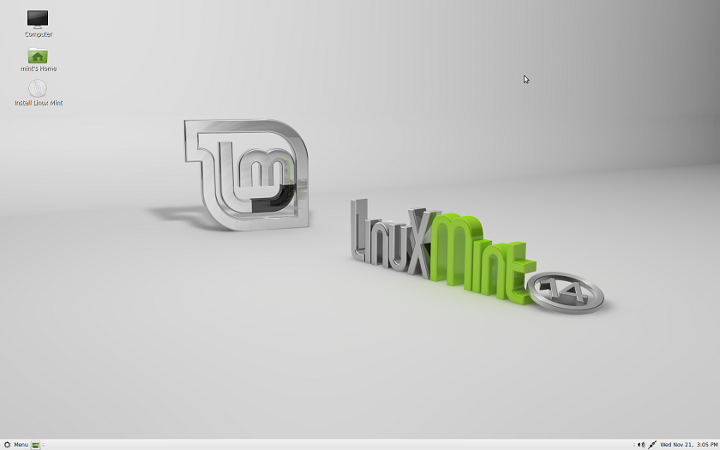 Linux Mint FTW! It's almost the last of the sane-GUI distros.